By Cameron Allison for Military Town Advisor. Fort Hood is located in Killeen, Texas, halfway between Waco and Austin. Fort Hood Army Base is the largest military base in the world, consisting of more than 215,000 acres. Since it’s such a large installation, it’s important to know which side of the post your service member will spend most of his or her time. The base has three main entrances: Clear Creek Gate, TJ Mills Gate, and WS Young Gate. Read on for more information about neighborhoods near Fort Hood! Killeen is a typical military town with a lot of chain restaurants, big brand stores, and strip malls. Killeen is a great place to live with pockets of nicer neighborhoods, and it seems the farther you get away from the base, the nicer the areas become. Surrounding off post neighborhoods near Fort Hood includes Harker Heights, Copperas Cove, Nolanville, and Belton. Harker Heights is an extension of Killeen with newer planned neighborhoods and good schools. Copperas Cove, known as "the cove," is located out the back gate of Fort Hood and is a great place for a nice starter home. Nolanville seems to be the newest of the desirable communities with lots of new construction homes in a very family friendly area. If you don’t want to live close to post and want to be near a beautiful lake, then Belton may be a great place for you. Lake Belton area has a mix of military and civilians in the area. Most homes in Belton are larger and more expensive with less of a military feel, especially the closer you get to the water. 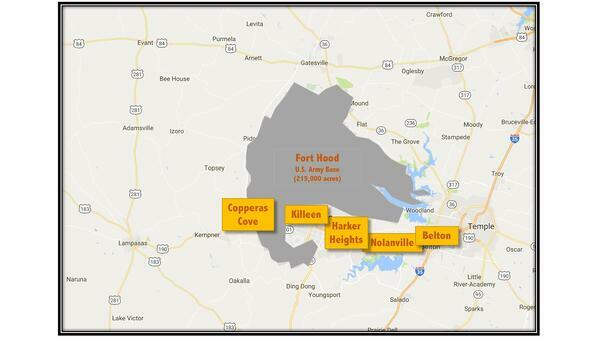 These off-post neighborhoods have many homes for sale and rent near Fort Hood ranging from small to large homes--whatever fits your families’ needs. Make sure to have fun while stationed at Fort Hood! Venture out to nearby Salado to enjoy a darling touristy small town, head north to Waco to visit Joanna and Chip Gaines’ famous shop “Magnolia,” and head south for big city Austin where you can hit 6th street and experience the Live Music Capital of the World! Share your experiences with other military families. 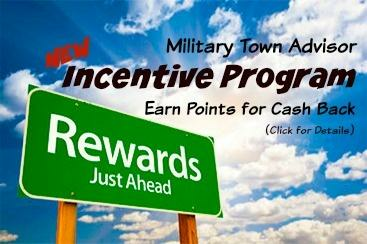 Leave a review today at Military Town Advisor and earn rewards!